There are many good fence and deck companies in Brantford - Don’t let your uncles, cousins, friends, brother’s kid build your Fence or Deck. Be Sure whoever you pick that they are covered by WSIB and Insurance and can prove it! We have been building quality fences, decks and gazebos in Brantford and the surrounding area since 1998. Over the years we have had many satisfied customers. We are the best choice for your fence, deck or gazebo project. Call us at 519-756-3443 or text 519-751-9066. We are a full-service fence & deck company, dedicated to bringing our quality workmanship and professionalism to the fence & deck industry in Brantford and area. 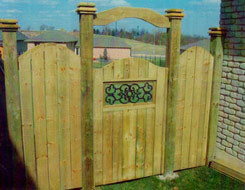 We provide residential and commercial fence installations. When choosing the right fence or deck, it is important to have all the facts to help make the most informed decision. We will be happy to help you decide on the type of style and fencing and / or deck that best meets your needs. Browse through the gallery of some of our work for ideas of what you want in your fence or deck. Whether you want your fence for privacy, beauty or just as a property line designation, we have the right fence for you. We are not a post hole drilling company. We will only drill post holes for fences that we are constructing.